Katherine Hillbrand of SALA Architects. Photo by TJ Turner. Katherine Hillbrand, this year’s recipient of the Architect of Distinction award, is captivated with the Scandinavian concept of “useful beauty,” or nyttige skønhed in Danish. In Hillbrand’s residential architecture, the concept translates to artful design in which experiential spaces brim with vitality, and authentic materials and exposed structural elements express sustainability, simplicity, and integrity. In the house Hillbrand calls “Down to Earth,” these design principles dovetail in sleek, modern ways. Finding herself in a Roseville cul-de-sac on an awkwardly shaped lot, Hillbrand devised “a block form that I pinwheeled to grab as much sun as possible.” She segmented the house for better placement on the site and transformed a pinched entry into a courtyard that doubles as a patio. 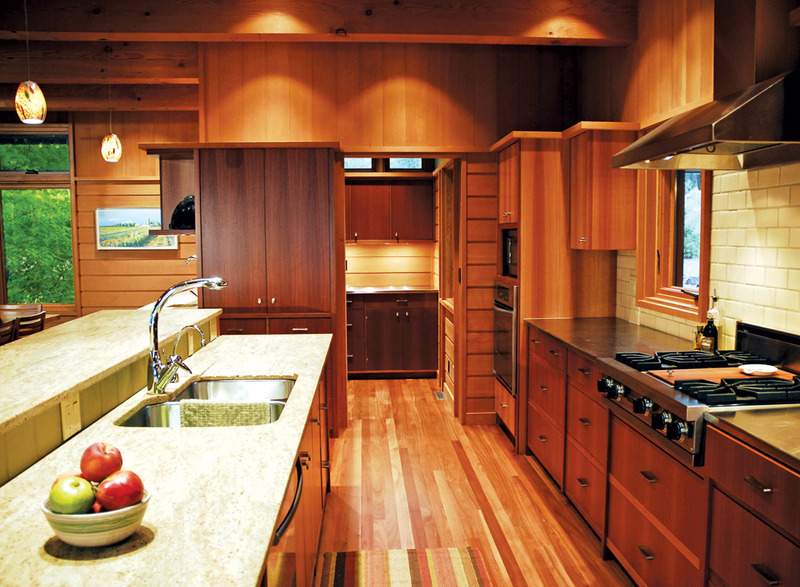 A geothermal system provides heat, while natural ventilation cools the house. 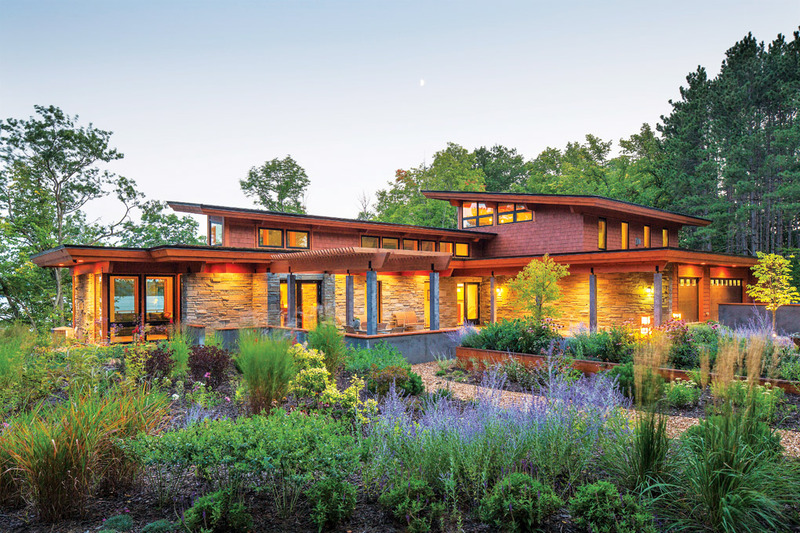 For this house on White Sand Lake in Wisconsin, she created a horizontal form with sloped roofs tilted toward the sun and lake views. Photo by Troy Thies. Designed for a potter, the home includes such earthy materials as concrete and cor-ten steel. Built-in shelving displays his pots. “I enjoy playing textures against each other,” Hillbrand says of the rough concrete walls, metal-roofed gables, horizontal sod-planted roofs, and exposed timber of the home’s exterior. 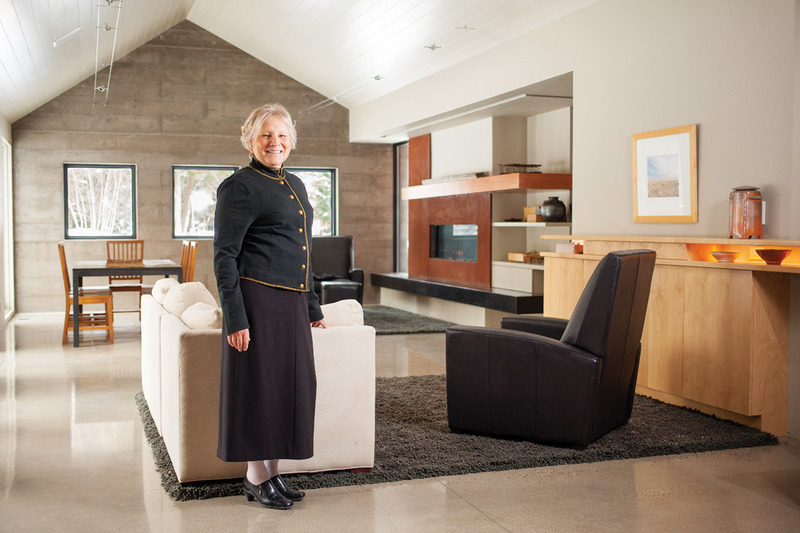 Initially a teacher and the mother of three children, Hillbrand came to architecture as a second career, as a way of marrying art and engineering. She received her schooling at the University of Minnesota, “a holistic experience where all of my instructors guided, inspired, and moved me forward,” she says. During her last year of school, she became enamored with timber framing and worked with Tedd Benson and the Timber Framers Guild. 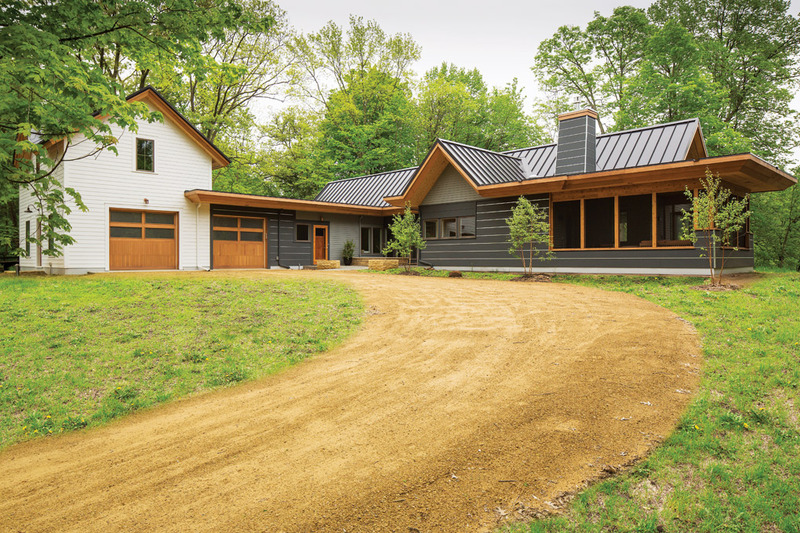 Designed to accommodate family and friends, this Wisconsin lake home maintains an intimate scale and celebrates its wooded setting. Photo by Troy Thies. She interned with James Stageberg and Bernard Jacob, then interviewed with several large design and construction companies. As she walked into one interview, her muddy boots leaving embarrassing tracks across the carpet (she’d come from a job site), she realized “I can’t do this.” She called Dale Mulfinger and Sarah Susanka instead. “During the interview, Sarah opened a beer, and we sat down and talked.” Hillbrand never left. 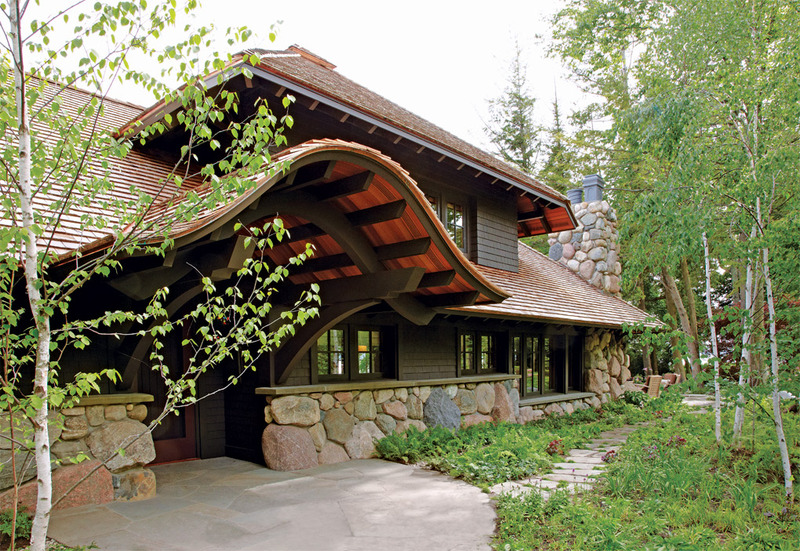 A low, undulating roof and boulder foundation ground this Michigan cottage to its site. Photo by Werner Straube. 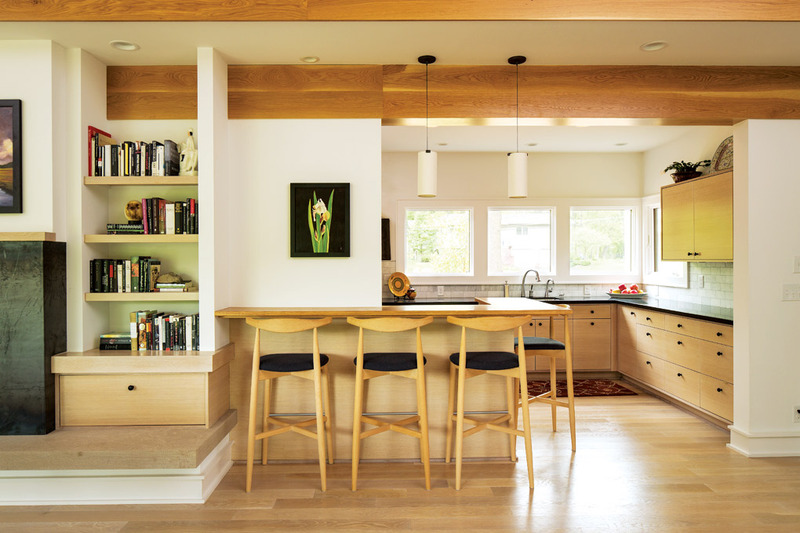 Hillbrand’s attraction to Scandinavian principle of useful beauty is evident in the open kitchen and great room of this house in Marine on St. Croix. Photo by Troy Thies. She recreated the simple lines of the white Puritan cottage at one end of the dwelling, while the dark, horizontal extension parallels the river. Photo by Troy Thies. Inspiring Work (International): Alvar Aalto—all of his work. Though his work is not architectural, I love Andy Goldsworthy. I am in awe of the incredible Japanese teahouses, both traditional and modern, that I have had the privilege of touring. And I love the Museum of Energy by Arquitecturia in Tarragona, Spain. Inspiring City (International): But of course, Copenhagen [Denmark] and Cinque Terre, Italy. Public Building (Local): Hands down, Joan Soranno and John Cook’s Lakewood Cemetery Mausoleum. Beautifully done. Neighborhood (Local): Marine on St. Croix. I love the scale, the understated, recessive expression of the homes, the nostalgic quality of the “downtown,” and the sense of community. Room to Design: It might be a bit embarrassing, but the bathroom. Material Trends: Thermally competent and very large windows, geo-thermal HVAC systems, staggered-stud wall construction with water-based foam insulation, metal siding, the death of asphalt shingles!